One of the most important tasks that a company must be on top of is the accounts receivable. Many businesses use complicated software to track customer payment history. 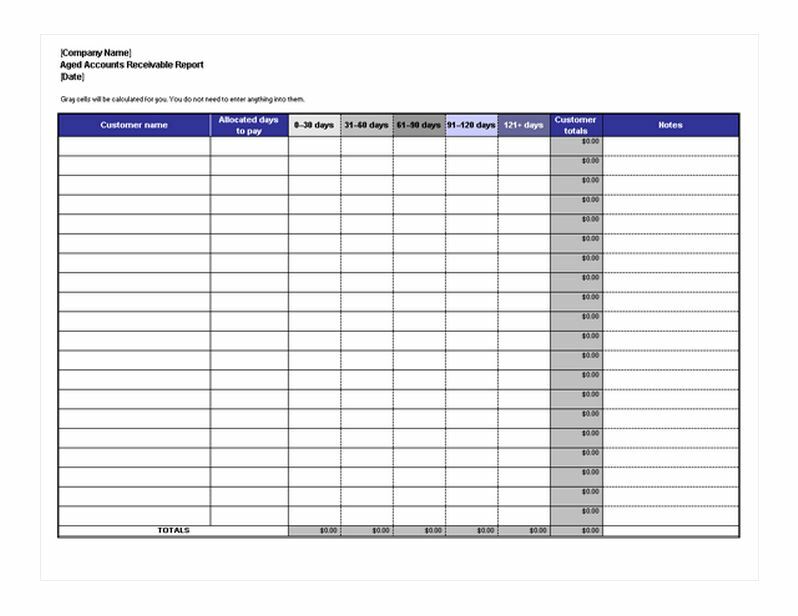 For those that do not need such software – a simple to use spreadsheet template can be used by your team to track payment history on customer accounts. The aged accounts receivable report template is easy-to-use and can be customized according to the needs of the accounts receivable team. The file can be download free on this page, and it is compatible with Microsoft Excel 2003 or later. Download the free template on this page to your computer and save it in any preferred folder or the desktop for quicker access. Once you have downloaded the aged accounts receivable report – find the file and open it to edit the necessary information. The first text areas you can edit are the company name and date located on the top left side of the spreadsheet. In the table area you will see columns and rows to be filled with the details for each customer account you want to track. You can enter a customers’ name, days they have to pay, add notes, and any other pertinent details. The gray cells will automatically calculate the amounts. The aged accounts receivable report can be used many times for multiple groups. This can be handy if your company sells various products or services, and assigns teams for various customer groups such as – those that buy plumbing supplies separate from those that buy garden supplies. The notes section can be used for entering information when a call to a customer had to be made in regards to paying their bill or for any other purpose you see fit. The aged accounts receivable report template is a cost-effective alternative to expensive accounting software. It is easy-to-use and customize. If you are seeking a simple way for your accounts receivable team to track customer payments and such, then download the free aged accounts receivable report to your computer today.